I really do love relays. Sometimes I think I want to do less of them, but then I run on a team and can't wait for the next one. I love the team experience and getting to know everyone even better. 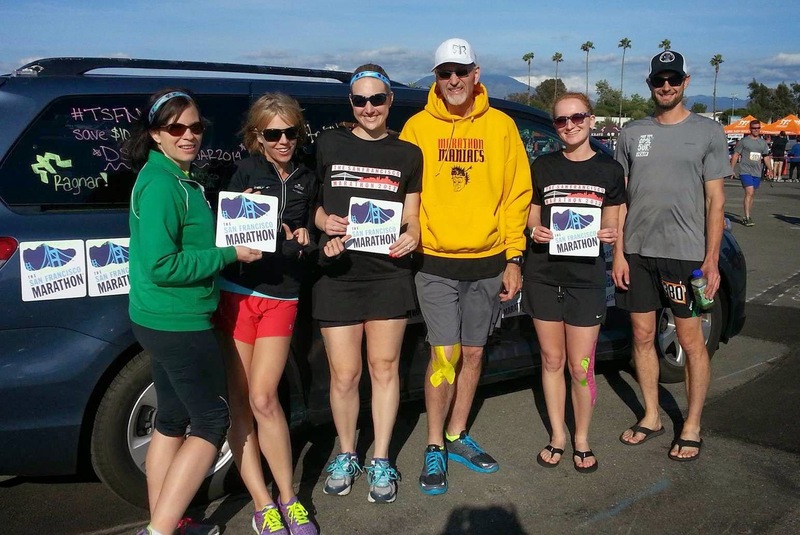 This particular team for Ragnar SoCal was comprised of SF Marathon ambassadors and captained by Chris. 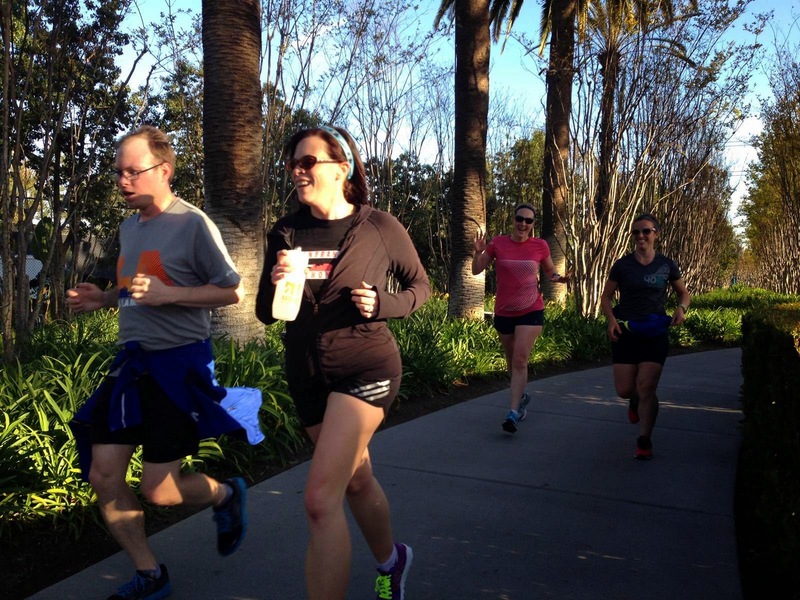 Chris is a Nuun hydration ambassador as well, and the race entry we had was sponsored by Nuun. The SF Marathon sponsored our vans, and a number of other sponsors sent us awesome gear and swag. 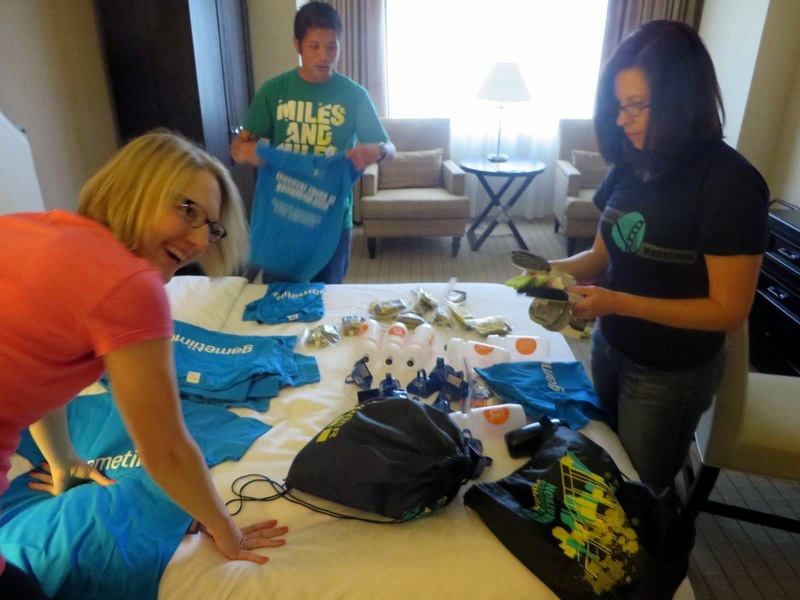 When we arrived at the hotel on Thursday afternoon, we started by sorting the goodies from our sponsors. We had t-shirts from Gametiime, a race directory website with a user interface I really like. Nuun sent water bottles, Picky Bars, cowbells, tattoos, and of course Nuun tablets. In addition to paying for the vans, the SF Marathon gave us tech shirts, cowbells, tattoos, and magnets that we used to decorate and to tag other vans. Skechers sent us each a pair of Go Run shoes, Zensah provided compression leg sleeves, and Fitsok gave us running socks. We were pretty well stocked up. Swag sorting. It's like Christmas! 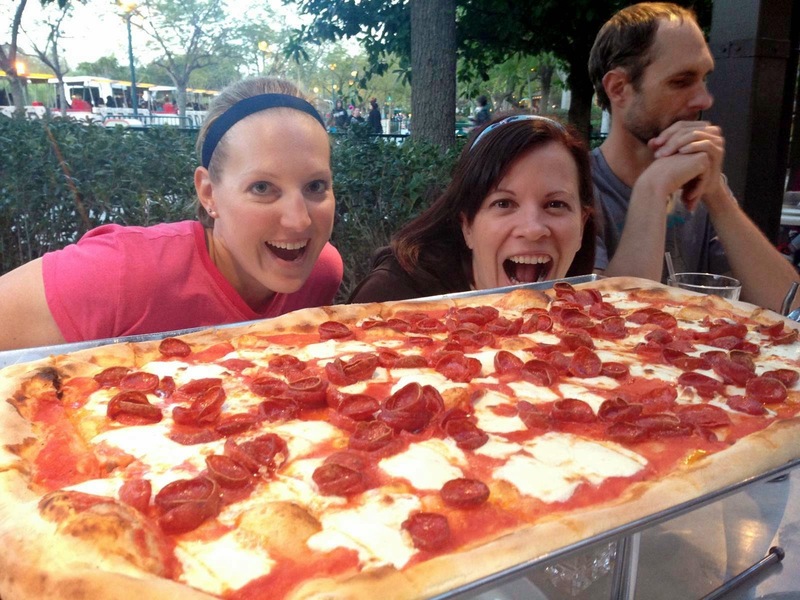 After going through the goods, we decided a short run and carb loading was in order. 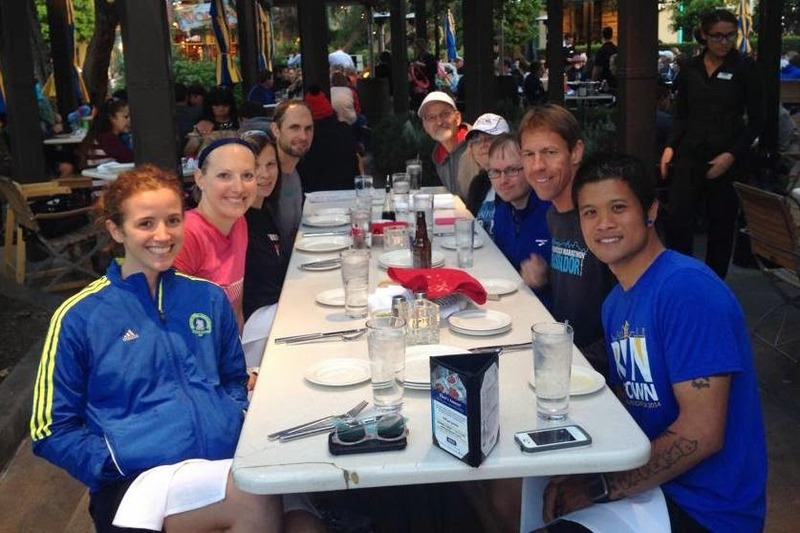 We ran as a group from the hotel to Downtown Disney and had dinner at Naples Pizzeria. Yum! And running to Disney? Awesome. I love Disney. There might have been some skipping to the music by me. Running with Wes, Alisyn, and Erin. Thanks to Keith for the photos. Best place to end the run. We bought the family size for 3 people. We did pretty well...and it was awesome pizza. Dinner. Erin, me, Alisyn, Matt, Bruce, Terri, Wes, Keith, and Chris. The next day our team start time wasn't until 12:45 pm, so we had lots of time to kill. I was in van 2, meaning we had even more time. We decorated the vans in the morning, then hung out at the hotel a bit before heading to exchange 6. We actually checked our van in, then left to eat in the area and came back to exchange 6. It worked out well because we didn't have to worry about how long we'd need to check in and to do the safety briefings. Van 2: Alisyn, Meg, me, Bruce, Miriam, and Matt. Many SFM magnets in hand. We were excited to finally see van 1 again at exchange 6. The worst part of the relay is not getting to hang out with the other van. Hanging with some ladies from van 1. Kristina, Miriam, me, Erin, Meg, and Alisyn. 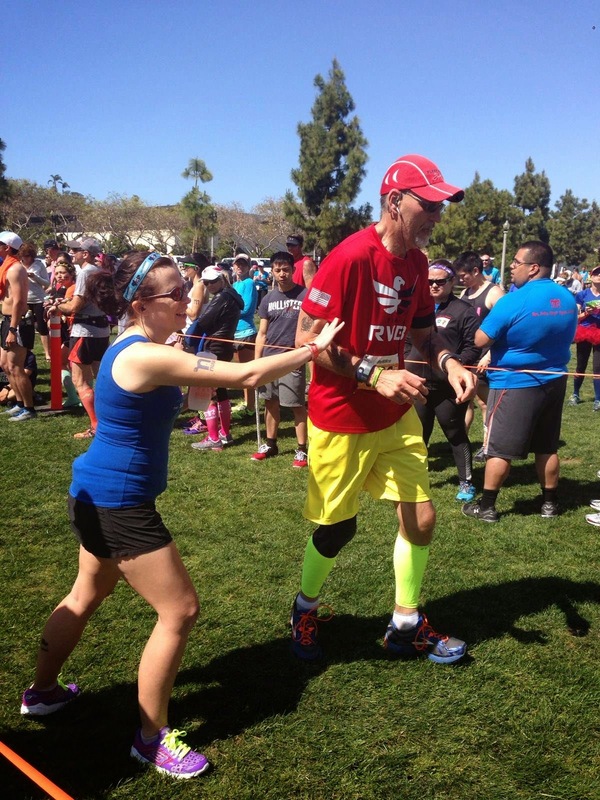 Saying a quick hello to Jocelyn before she continued on her ultra journey with Team Sparkle! Finally, van 2 was off and running around 6:15 pm. Matt kicked us off with a speedy 10 miles, and next it would be my turn as runner 8. I had the shortest run distances, which worked out really well in my post-injury situation, although I have to say there was more climbing than I expected. Apparently SoCal has some hills too. Although the photo above has daylight, don't let it fool you. It was dusk when I started running and quickly very dark outside. For most of van 2, the first two legs were in the dark. Leg 8 had a fun couple of miles on a bike trail, and it was super dark and kind of eery. But I loved it. It was weird to start so late in the day because the course is much lonelier until you catch up to other teams - I saw only one runner during leg 8. And I kept her behind me. Before I knew it van 2 was on the last runner and headed to the next major exchange. My memory of that exchange is that it was very dark, they had coffee, and it must have been on a beach because there was sand. Alisyn came running in, Keith headed out, and we were on our way. I begged for a quick food stop, had a burger from Carls Jr, and then went to exchange 18 for rest. I think I slept more/better in this relay than I ever have before, although I have no idea why. Exchange 18 was on a beach and was super lovely in the early morning hours. The weather was great, cool but sunny, perfect for running. And I felt more ready to run again than I ever have in a relay. Perhaps it was the salt water taffy they handed out there? Again, the legs in van 2 flew by in the darkness. My overnight leg wasn't anything exciting to speak of, although we were finally catching up to slower teams and had tons of people to pass. That became fun. Alisyn had sunrise around the time she started running, so it was finally time to ditch the reflective gear and to run in daylight! Keith ready to head out. Van 2 rest time photo. Next up? Denny's for breakfast! Eggs and pancakes tasted so good. I wasn't even running that many miles but I sure ate like I was. Relaying makes me hungry. The next exchange we headed to was 30, and it was again on the coast. What a view! I thoroughly enjoyed our time hanging out at that exchange. Such a terrible view, eh? Sleeping area on the coast. Chris speeding in for the last van 1 exchange. And Matt on his way out. I have to say again that the weather was awesome. Not too hot, not too cold. The last leg got pretty hot in the sun for sure, but nothing like I thought it might be in SoCal. My final run was super short at 2.8 miles and had a bit of dirt path with an ocean view. I got to pass quite a few more people; we were really into (or even through) the thick of the crowds by then. Meg wrapping up her last leg. Bruce's last handoff to Alisyn. After that handoff, we had a heck of a time getting to the finish line because of traffic. We realized our van wasn't going to make it by the time Alisyn finished her 6ish miles, so a few of us jumped out of the van and ran the last half mile or so to the finish area. It's too bad we weren't all there to cross the finish (Matt and Meg stayed with the van) but there wasn't much we could do at that point. We crossed the finish line with a time of 26 hours, 40 minutes, 56 seconds. That was good for 8th place out of 510 in the mixed open division, and 24th overall out of 710. I'll take it! 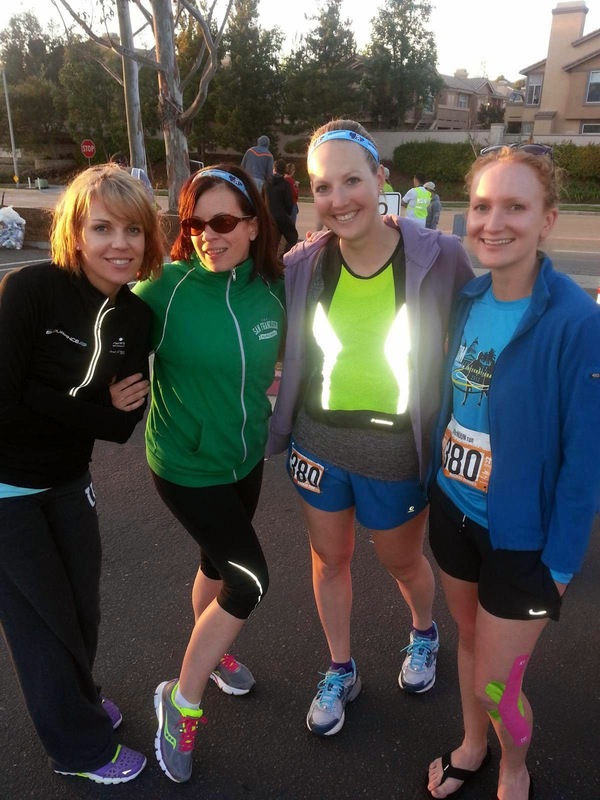 Team afterNUUN run at the finish! Bling. Not a bottle opener this year. 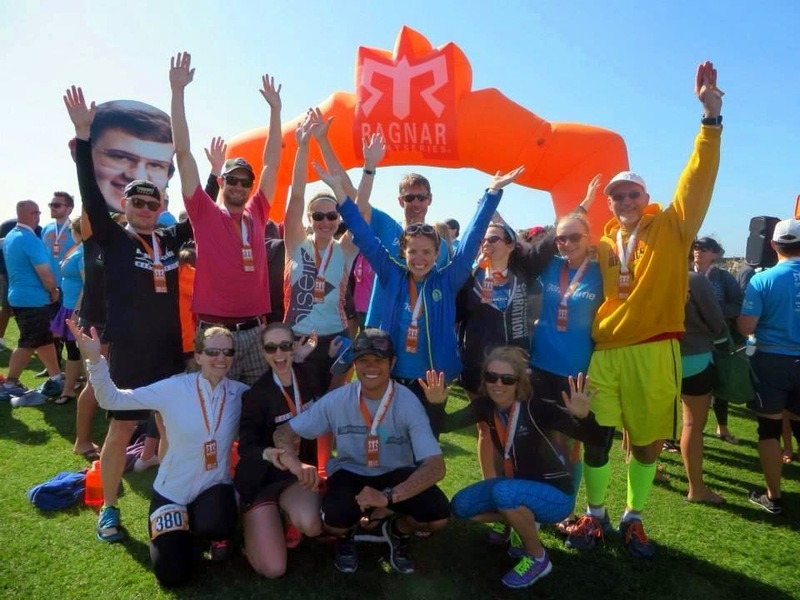 This was my third Ragnar Relay event, and it was easily the weirdest from a planning and organization perspective. Aside from the major course changes they had to make last minute (not their fault, not an issue here), there were a few things I felt could have gone better. First and foremost, organization at the exchanges. Usually there is a little in/out loop where one runner runs in, hands to the next runner, and that runner runs out the other side. This relay had those in/out areas but no one was using them and volunteers weren't directing us to. It was a weird free-for-all with people standing in the way and no one going through the turnarounds. This of course isn't the end of the world, but it became a little chaotic to find people at times. Second, there were no indoor sleeping areas. All of the sleeping areas at major exchanges were outside, say on the beach, and they also didn't have indoor restrooms. Fine, I can rough it, but I always did enjoy washing my hands for real with indoor restrooms at other Ragnar events. Sleeping on the beach like at exchange 18 sounded like a mess of sand, plus it rained/misted a bit and we would have been wet. Last, traffic to the finish was awful. I'm not sure how any van 2s arrived in time to see their team finish. I think Ragnar caused the traffic itself; everyone had to get into the parking garage to park before going to the finish and the back up to the streets of San Diego was huge. Don't get me wrong, the race was still great, just different from others. I also have to mention the great way it differed - we each received one free beer at the end. 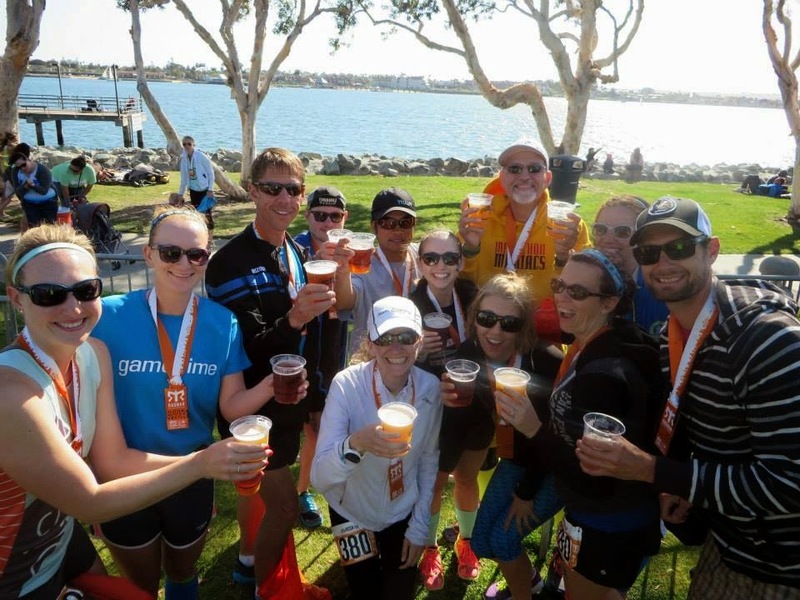 This is a Ragnar first for me! I thoroughly enjoyed my Sierra Nevada at the finish. I also loved the bright blue color of the Ragnar shirts this year. The end! On to the next adventure. It was great to be a part of the race this year. Congratulations to you and the team!! Thanks! We appreciated everything you did for us! Fun hearing your perspective!! The changes to the course this year, and the date change, look so great - first year with nice weather ;). They used to have food for purchase at exchange 18, but it was at a resort the last two years - strange they wouldn't set something up at the new location. Leg 9 ran by the school I was at for #1's track meet! I was hoping I could spot some runners, but I missed everyone. Yes weather was PERFECT. I couldn't have asked for better. I liked the course a lot too. Hopefully they'll keep it! Sounds cool. I am doing Ragnar DC in the fall. Looking forward to it, but going in with a little hesitation. That sure sounds like fun :) Even with the lack of sleep and running in the dead of night. Wish I took more advantage of running in SD when I lived there. ah well. And that pizza looks delish.